Translations and notes © 2016 by Chris DiMatteo. All rights reserved. Is this Gaspara Stampa playing the lute with her sister Cassandra behind her to her right? Here are my English translations of two sonnets by Gaspara Stampa, the most renowned Italian woman poet of her time and one of the most skilled and interesting poets ever, regardless of gender. Her collection of 311 RIME (Rhymes) is an eloquent and deeply personal emotional autobiography. Her sister Cassandra published them in 1554 right after Gaspara’s untimely death at the age of 31. She addresses other women directly in her writing: in Rime, number I, at line 9, “E spero ancor che debba dir qualcuna” (I hope some lady will see fit to say); in the first line of N. VII… “Chi vuol conoscer, donne, il mio signore” (Ladies, if you wish to know my lover) and in the first line of N. LXXXVI, “Piangete, donne, e con voi pianga Amore (Cry, ladies, and Amore cries with you). She also addressed other women directly in her life as a poet, musician and singer in the very lively city of Venice of the early to mid 1500s. 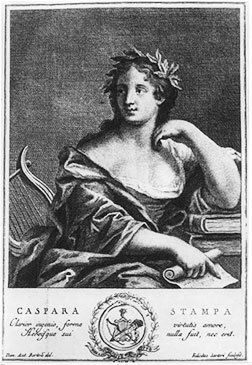 Gaspara Stampa was famous for her music as well as her poetry, during her short life. She wrote and played songs but sadly only her reputation as a singer and lutenist has been preserved, and none of her music. Yet there is a famous painting where I believe she is depicted, playing the lute and singing. 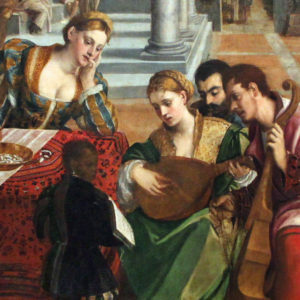 In the painting below, I believe that is a depiction of Gaspara Stampa in the middle playing the lute and her sister Cassandra at the table behind her. They sure look the part. Gaspara Stampa and the painter, Bonifazio de’Pitati, were contemporaries in Venice and she was well known as a musician. I have searched in many books and articles for any reference to this being a depiction of Gaspara Stampa. I have found no reference to it, even in several sources where I thought, surely if this discovery had been made, it would be published in that place. I first published my thought that this painting shows Cassandra and Gaspara Stampa on this page in October 2016. I will keep looking for previous citations but until I find one or someone shows me one, I think this could be my own discovery. “Il convitto del ricco epulone” by Bonifazio de’Pitati, a.k.a. Bonifazio Veronese, in the Gallerie dell’Accademia in Venice. The title means “The Banquet of the Wealthy Gourmand” and depicts the biblical story of the rich man and Lazarus. I believe that is Gaspara Stampa playing the lute and her sister Cassandra behind her. That I lament for reasons so sublime. against such woes and with such clear intent! that even I, that way, could be her peer. per sì chiara cagio danno ì chiaro! who sadly, is for me in love repressed. No pity does my cruel lover feel. fuor ch’un poco (oimè lassa!) empio in amore. non fa pietoso il suo crudel amante. Raffaello Sanzio, Madonna Sistina, Vatican Museum (detail from the bottom of the painting).